Ankle exercises are vital if you want your leg to be strong again. These activities are simple and vital after you have injured your lower leg. It could be a pulled muscle, as in the calf, for example, or sprained ligaments as can happen if your turned your subtalar joint. Scar tissue forms after injury making the soft tissues shorten and contract. Unattended, this scar can make the injured joint permanently stiff, altering the way you walk, your gait, with a knock on effect on the knee, hip, pelvis and back. It is important to regularly stretch after injury to ensure that a healthy and supple scar forms. Otherwise you're going to be needing more ankle sprain treatment in the future. Prevention, that's what it's about. Don't let this happen. This page was last updated by Dr Barrie Lewis on 7th December, 2018. Ankle sprain treatment by a chiropractor will be quite different from other professionals. First the subluxated bone(s) in the ankle (usually the talus, calcaneus or cuboid bones) must be corrected with a chiropractic help adjustment, and then simple mobilising ankle exercises are vital to keep the joint supple and free. It also helps disperse any fluid that has built up after a sprain or fracture. Is your ankle swollen? For more about a sprained ankle. The alternative is chronic foot pain. Stop Press: Stones in my Clog my third book is available as an ebook for around three dollars. Ankle exercises are the key to a healthy leg after a lower limb injury and these alphabets are a good way to begin. Sit deep in a chair, with your leg stretched out in front of you, and a bare foot. Imagine that you are going to trace the letters of the alphabet, starting with the capitals, in the air with your big toe. Dorsiflex your foot by lifting your toes up towards your head, and then trace out the letter A. Do five every time you have a cup of tea, or glass of water. This exercise is active. You are using the muscles of the leg to move the foot. You could also do it passively by hooking a dud bicycle tube under the forefoot and pulling your ankle into dorsiflexion using your hands. Then allow gravity to drop the limb again. Go through the alphabet at least once a day. The beauty of these alphabet exercises is that they are non weight bearing so, no matter how bad your injury or how much arthritis you have, they won't be very painful. Like swimming, non weight bearing exercises benefit arthritis and help regain the full range of motion. It's interesting that gentle movement actually polishes away the crystals that form in the joint where the hyaline cartilage has been damaged, and perhaps worn right through. Gentle stretching of sprained ligaments is important. The alphabet ankle exercises are equally effective for your ligaments. "If it's not fun, it's not worth doing. And it doesn't have to be silly. It can be hard work and it can be edgy. It can be a lot of things. But it can also be fun." An ankle sprain often strains muscles and their tendons. 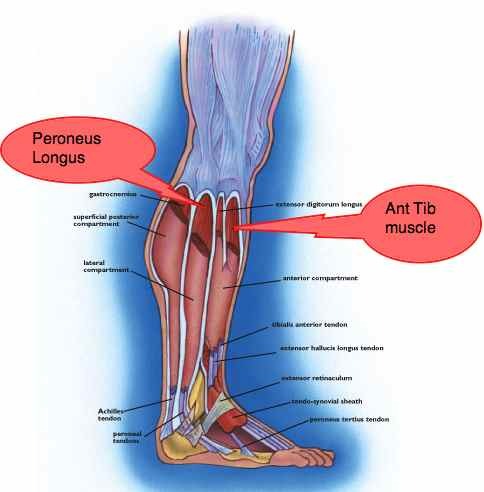 Most particularly the muscles on the side of your lower leg (called the Peronei; there are three, Longus, Brevis and Tertius) together with the gastrocnemius and its Achilles tendon. To exercise the Peronei, lie on the floor and hook your kapot bicycle tube over your foot, and the other end over some fixed point on the other side of your foot. Start by pulling the toes towards your head against the pull of the tube, then do it an an angle. 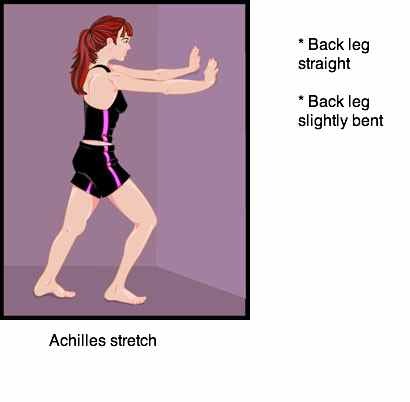 They are difficult muscles to stretch without putting undue stress on the injured joints. 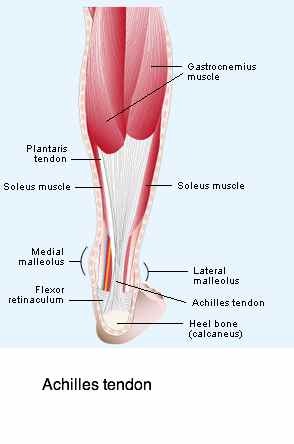 To exercise the Gastrocnemius mucles (and its oft forgotten companion, the Soleus, the cause of Shin Splints stand on a hard floor, go up on your toes. Start using both feet together, gradually putting more weight on the injured foot. Do this regularly through the day. To make it more difficult, stand on the balls of your feet on a step. Go up on your toes, and then sink deep, before flexing your ankle again. Do it with the ankle guard on to begin. 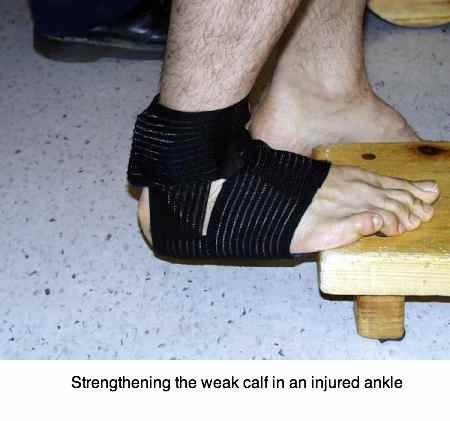 You won't be able to do this if the talus is still fixated - you will get sharp pain, deep within the ankle. First have the joint adjusted. 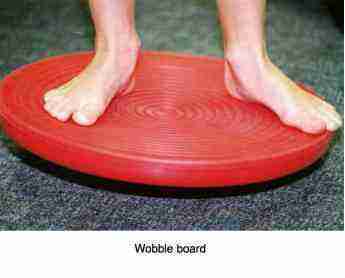 Buy yourself a wobble board to do proprioception training after an ankle injury. Start with sports shoes to give the ankle support, but graduate as soon as possible to bare feet when doing your ankle exercises. Walking is, of course, the best of your outdoor ankle exercises. Normally we would suggest that you don't walk on tarmac or concrete but, in this instance, it is recommended. That joint can turn again very easily if the ligaments have been torn. So go walking initially on a level surface, with your ankle support and good shoes. How do I know? Because I've done it myself, with excruciating ankle joint pain all over again. Then graduate to level grass for your next level of exercises, finally removing the ankle guard and even your shoes. This immediate contact between your foot and the ground gives your lower limb intimate contact with the brain in what we call proprioception. Actually, it's training your central nervous system. Here's another suggestion. When you are done with your wobble board and ankle exercises, give it to Mum for a Christmas present. Research shows that elderly persons who do proprioceptive training of the brain are far less inclined to fall and break a hip. You can read more about this in one of the back issues of our monthly newsletter. Signing up at the bottom of this page gives you access to all the back issues from Chiropractic Help. They are free. The ankle is less prone to arthritis than the knee and hip, and neck, for example but, after injury, should any joint remain fixated, it will become prone to so-called immobilisation arthritis. Chiropractic certainly has a role to play but not all of my colleagues specialise or have an interest in the lower leg; ask before making an appointment. Think ankle exercises; they are a vital part of chiropractic care of any injured joint. 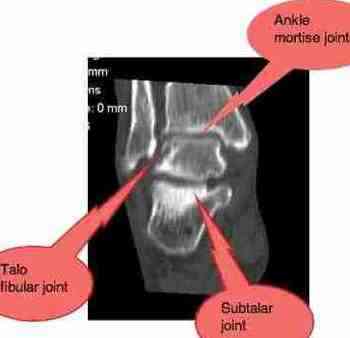 This ankle joint pain casefile is of a 36 year old woman who fell down the stairs 11 years ago. Ever since she has walked on her toes. HYALINE CARTILAGE ... the tissue at the heart of chiropractic. The obese are also prone to debilitating arthritis in the ankle and knee. It's a combination of simply too much weight on the cartilage, and the poor nutrition that allowed you to become so large in the first place. So, more ankle exercises. Not dealing with these issues means that a life without medication becomes a pipe dream. Prevention is the key when we're discussing ankle joint pain. Restoring the normal joint movement, and rehabbing the muscles and ligaments with these simple ankle exercises is vital. However, the past is set in concrete. If you have advanced arthritis of the ankle, then amazing new developments with an external distraction device is proving very successful, allowing the cartilage to be restored by taking the weight off the damaged cartilage, whilst allowing full movement within the joint. Click here for more info. Shin splints is a miserable condition that sportsmen and women get; the pain in down the inner shin bone. The muscles involved operate the foot, so gentle ankle exercises are a vital part of healing. I'm a believer in good surgery, when conservative measures have been exhausted. A good surgeon can do wonders. I'm treating a lady right now who fractured her heel into a dozen fragments when she fell down the stairs. The orthopaedic surgeon, a woman to boot, did an excellent job. Freeing up the fixations in her foot has got her walking almost normally again. Of course the greatest risks of surgery are often in reality the dangers of a general anaesthetic. From Ankle Exercises back to chicken bones for a bouillon rich in the protein needed for healing of cartilage. Have A Question About Your Foot? Share your question. 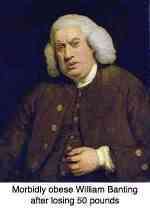 Perhaps I or someone else can contribute to the misery that foot and ankle joint pain can cause. TIP: Since most people scan Web pages, include your best thoughts in your first paragraph. And it helps friends or family to rate your question and my answer. There is no charge for this service. But, if you feel my answer contributes, perhaps you'd like to buy one of my three books of chiropractic anecdotes. Do you have some X-rays to add? Great! Click the button and find the first one on your computer. Select it and click on the button to choose it. Your information is worth gold to my 'library'."